Outsourcing food services means having a partner that will help transform your campus to attract students, plan meals that appeal to a wide range of tastes and optimize dining revenue and expenditures. While you are sold on this value, your campus may not be—yet. 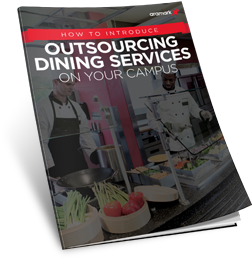 Use these talking points to introduce outsourcing dining services on your campus. It’s time to prove the value—get your guide today.